Dealing with digital transformation in an age of shrinking budgets can seem a daunting task. Faced with a blank sheet of paper some organisations, and people, can be paralysed into inaction. But the old ways of procuring and developing technology have been replaced by a much more flexible model which makes the journey far less painful. 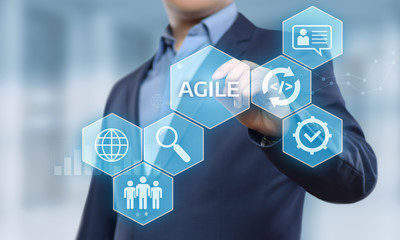 Agile development began as a process of software development but it has proved so successful that it has moved into the mainstream of how organisations work. It means using technology to inform better and faster decision making. It can bring together departments by improving communication and help create a culture of collaboration instead of competition. By focussing on ‘small wins’ and step by step improvement it avoids the pitfalls of big projects with long lead times. Because feedback is checked at every step it also stops projects going off track and keeps them focussed on the business or customer goal. For local authorities it can offer less risk than traditional ‘waterfall’ development models which proceed in rigid phases and are all but impossible to change once set in motion. But shifting to agile development is not an end in itself. The real benefit of building an agile infrastructure is that it allows the organisation to develop agile and adaptable services which can respond to citizens’ needs. Building a platform which can develop with the organisation will help power the digital transformation which will allow local authorities to maintain and even improve services in the face of continuing budget pressure. Innovation foundation Nesta has done some research into what the ‘Connected Council’ will look like by 2025. They found that although most councils have made good progress in getting basic transactions online many still have some way to go in digitising their back office functions. Nesta also noted that digitising is not just about offering digital services. Digitisation can help save money and improve outcomes by changing the way councils work internally, buy services, analyse and solve problems and use public space. It can also make service delivery smoother, easier to access, more personalised and more responsive to citizens’ individual needs. Digital transformation and big data can also improve decision making and provide better support to local businesses. Innovate UK is working with seven councils to create tools to improve retail performance of city and town centres. The tools analyse footfall data (pedestrian visits) and combine it with sales data from shops to improve council decision making and make local High Streets more attractive places to visit. Leeds City Council began using live web chats in order to reduce call centre costs but used the data collected from those interactions to make hundreds of improvements to its website which in turn created further savings as more people were able to find the information they needed without turning to a call centre. Nesta’s researchers also see a role for central government in supporting this process by defining open standards for data across the public sector. It could also help councils form their own market place for applications and digital products which could be shared and re-used by different organisations. Local authorities taking the first steps will hope to find plenty of practical help available, with some of it coming from central government. A core part of this help is the Public Services Network, a trusted, shared infrastructure that connects organisations delivering public services to each other and to cloud based and hosted services they can use or share. But best practice shows the crucial first step is getting different parts of the organisation working together. Projects which work will often bring unexpected benefits alongside the original targets. By starting small with agile aims, local authorities can quickly build and adapt services which can then be rolled out across the organisation. This reduces the risks and costs associated with large scale, fixed target technology projects. Bedford Council found this when it trialled a mobile working solution from Vodafone. The council has an ambitious target of using technology to create savings of £10m per year by 2020. The trial was so successful that it was quickly expanded to include the other regulatory teams including Health and Safety, Noise Pollution and Trading Standards. The project is expected to see a return on investment within three years with savings being reinvested in front line services. The council is considering rolling out mobile working to other departments including Adult and Child Services and Highways and Planning. The move away from paper to digital has freed up office space previously used for storing paper files. But the unexpected benefit was not financial. The key success is making these projects not just technology projects. They should be run by multi-discipline teams and they should genuinely listen to the staff who will be using the new devices and applications. The right technology strategies can help councils with how they interact with citizens, enable their own staff to work more flexibly and allow the capture of data to improve decision-making across the organisation. There is no doubt that local government has a tough job to do in embracing digital technologies, improving existing services and continuing to find cost savings as well. But embracing smarter ways of procuring, developing and maintaining your technology can help you achieve all three goals. There are many examples of local authorities across the country using agile development to power digital transformation. Many of the most successful have involved working with other authorities as well as with technology providers. By building teams from across the organisation and an agile infrastructure to support them local authorities can ensure their services are flexible enough to stay relevant for the changing needs of their communities whatever the future might bring.